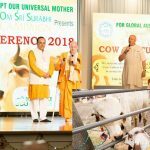 Considering not only religious acknowledgement, but also the economic, physical and scientific benefits of protecting the cow, it is the responsibility of all humans to contribute to the mighty task of cow protection in today’s world. Vedic civilization, presently known as Hinduism, is based upon the principle of the omnipresence of the divine, and the presence of a soul in all living creatures, animals and plants alike. While all these creatures have their own distinguished status based on their level of consciousness, due to their distinctly superior qualities the cows are given a very high status in the Vedas. To begin with, the Sanskrit word for the cow is ‘Gau’, and for cattle is ‘Pashu’. Such are the benefits of the cow, that India’s ancient scriptures define the cow as the “Mother of all civilizations”, and her milk nurturing the whole population. Since the cow milk promotes Sattvik qualities, it has calming effect and improves meditation. The ghee is used in all religious food and ceremonies. Also used for Yajna or Fire Worship, which is stated as the highest form of physical worship in Hindu samskars. Cow dung is useful in the form of fertilizers, fuels, disinfectants in homes. Latest research shows that the effects of a nuclear holocaust and its radiation are to a very large extent nullified if the walls of the mud or brick walls are covered by cow dung. Cow urine is used for religious use and for medicinal purposes. Scientific investigations also show that cow urine contains samples of gold in units per 100 liters. In Vedic texts, the supreme purificatory material is called as the Panchagavya, which is a mixture of five products, namely cow milk, ghee, curd, urine and dung. 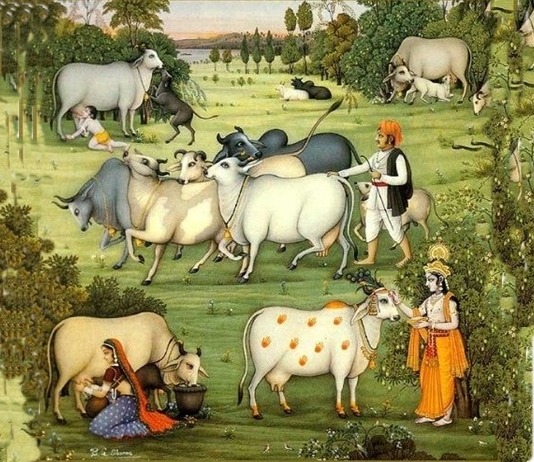 The Puranas depict a story when the Mother Earth as Goddess Prithvi came in the form of a cow, and King Prithu milked her to generate crops for humanity in order to end a famine. 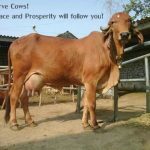 Kamadhenu or the miraculous cow of the Devtas is said to be a source of all prosperity. Sanatana Dharma is a divine code of conduct prescribed by the Lord. There are Shrutis, Smritis, and Dharma Shastra that glorify the cows and the fruits of serving them. The body of the sacred cow or Gomata is depicted with gods and goddesses. Vedic texts describe the Rigveda to be the back of the cow, Yajurveda being the middle portion, Samaveda as the stomach, Tatakas as the horns, Veda sukta are the body hair, Shanti karma and Pushti karma are the dung and the urine. Lord Brahma and Lord Vishnu are depicted on the roots of the two horns, sacred reservoir on the tip of the horns, Lord Shiva on centre of the head, Goddess Parvati on edge of the head, Kartikeya Swami on the nose, sun and moon in the eyes, Vayu in the dental range, Varuna on the tongue, Godess Saraswati in the sound, Dharma on the thigh, Sadhya deva in the heart, Ganga in the urine, Saraswati in milk, Narmada in curd, Agni in ghee, 33 crore gods in hair, and fragrant flowers on the body. and promote the divinity of cows. The Rigveda refers to the cow as Aghanya, or that which cannot be killed under any circumstance. 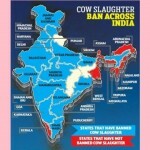 The Atharva Veda states that those who eat cooked or uncooked flesh of the cow should be put to end. And till the sun shines shall the world have cows. 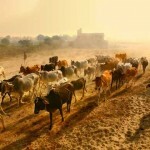 The Yajur Veda states that cows and bulls must never be killed and always deserve to be protected. Krishna is the epitome in His role of Gopala, the protector of the cows. Service rendered to the cow is equivalent to service to the Lord and one not only enters a transcendental delight and eternal oblivion in the other world but very much in the present living context, the visible truth and its conscious reality. Not only considering religious acknowledgement, but also the economic, physical and scientific benefits of protecting the cow, it is the responsibility of all humans to contribute to the mighty task of cow protection in today’s world. 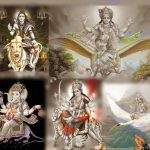 Next articleLord Shiva – Myth or Master?